Sanjeev Sharma has taught business innovation and finance in business schools in North America and Asia and provides consulting services in New York region. He has over two decades of experience in technology, finance and venture capital roles. Sanjeev identified disposable income as one of the most important factors for the economy and stock market and has used it to predict major macro-economic events and the movement of the Dow. His predictions about the stock market have been consistently correct for the last 5 years. Some of these predictions include the recovery of US economy in May 2009, level of Dow in Dec 2010 an year earlier and that Dow will start falling in 2nd quarter of 2011. Sanjeev was able to switch his entire portfolio from stocks/REITS to money market funds in early 2007 before the market-crash, and after 2 years in 2009, switch it all back to stocks/REITS. Earlier this year, we published Sanjeev Sharma's stock market prediction for 2015 and how he believed the market would rise. Below his latest Q&A style interview following up on this earlier article to discuss current market volatility. Where Will The Dow, S&P Be At The End Of 2015? Disposable income is the amount of money left from wages after spending on essentials like food, fuel and housing. The author's formula for correctly predicting the stock market was created using statistical analysis of certain disposable income factors. Is There A Formula To Predict The Dow, S&P For 2014? Multivariate regression analysis utilizing factors from 1982-2010. Where Will The Dow And S&P Be By The End Of 2019 ? Where Will The Dow And S&P Be By The End Of This Year (2018)? Major stock indices like Dow and S&P change based on the purchasing power of the middle class. Purchasing power changes based on disposable income. Author is using a formula he published in 2014 to predict for Dow and S&P for end of this year. Where Will The Dow Be At End Of This Year 2017 ? Author has used disposable income formula to predict the stock market since 2009. Using the same formula, he predicts the stock market for 2017. My interview where I discuss what President Trump can do to protect jobs from artificial intelligence and robotics. Video length: 00:20:02. Sanjeev Sharma, who predicted the surprise Trump win, shares his thoughts on the election and economy. Audio length 00:15:05. Description: There are only 5 main methods that have been used in almost all innovations. 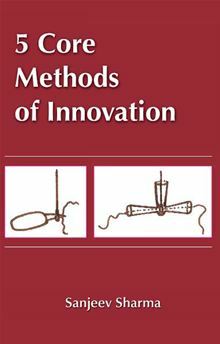 The book "5 CORE METHODS OF INNOVATION" explains how these methods have been applied in products, processes and industries as wide ranging as finance, Information technology, mechanical tools,consumer electronics and internet. There are only 5 main methods that have been used to create almost all innovations. The book "5 CORE METHODS OF INNOVATION" explains how these methods have been applied in products, processes and industries as wide ranging as finance, Information technology, mechanical tools,consumer electronics and internet. Sanjeev Sharma has taught business innovation and finance in business schools in North America and Asia and draws on his two decades of experience working in finance, venture capital and technology roles sharing insights into the strategies of many companies and also explains the workings and problems of the venture capital industry. Sanjeev Sharma gives examples of innovative products and explains the methods that have been used in creating these products. He explains how products ranging from simple household items to cutting edge electronics and telecom products, all utilize the same basic methods of innovation..